On the path towards the implementation of nearly zero-energy buildings, as stated by the European Commission, the integration of photovoltaics technology in buildings (BIPV) has been proven to be very interesting in order to achieve the energy goals. In detail, the use of glass BIPV modules is constantly improving due to the fact that they can replace almost every conventional material of the building envelope and they can actively contribute to the building energy balance. But, is the transfer of PV in architecture only a matter of energy? Certainly not. Along with the multifunctionality of the building skin, BIPV today involves a new aesthetics in contemporary architecture. Thanks to innovative possibilities in glass development and customization for BIPV solution, a wide range of architectural languages arises in current applications, ranging from the visible semantics of solar cells to the technological mimicry. The aim of this paper is to describe the current researches and trends of innovation in the use of BIPV glass for building facades, through the discussion of some pilot case studies collected by the Swiss BIPV Competence Center (www.bipv.ch) in the framework of different projects. Moreover, this study will create a platform for a primary discussion aimed to describe the innovative factors concerning the technological transfer of the PV glazing elements in the built environment. The use of a material in architecture, in the course of building history, has always been enriched with something other than simple technological innovation, including a symbolic spirit, expressing its own linguistic value, the change and the design power. In the common imaginary, for example, glass is the material that can express a sense of constructive and perceptual lightness, which peculiarities result in the physical dematerialization of the architectural object and in obtaining a perceptual and psychological transparency. When we hear about photovoltaics, however, the image that is invoked in our mind is a blue or black element that usually seems to “overload” the aesthetical image of a building. Even though a PV element has the basic role to produce renewable energy, this is not the main aspect concerning the “innovation in architecture”. The combination of glass and photovoltaics, despite their different appearance and materiality, seems to match well in terms of both aesthetics and functionality of the building skin and the “BIPV glass” market is expected to grow in the forthcoming years . Moreover, both in architecture and research perspective, there are many products, flagship buildings, research projects and some arising innovation trends that represent drivers for a successful transfer of BIPV glass into the real built environment. Since a lot of requirements are more and more needed for a high-quality architectural project also compliant with challenging energy levels, these “innovation trends” can be interpreted as the “meeting points” between different fields: architecture, construction products, glass facades and energy. In accordance with this perspective, the authors will investigate and show some of the innovative drivers that arose out of lighthouse projects in Switzerland. The origin of BIPV is a pioneering experimentation conducted in architecture in 1978-82: a glazed surface of a residential unit in Munich designed by Thomas Herzog in collaboration with Fraunhofer ISE that is still today an undiscussed reference on both PV technology and integrated design approach. Since 1990s, the trends of BIPV has increased worldwide both in terms of research and industrial projects for improving BIPV products/processes and applications in buildings. For instance, one of the first BIPV glass façade has been realized in 1991 in the Public Utilities Building of Aachen (Germany) where PV cells have been included into insulation glass panels, which have been used to replace the existing 20-years-old southern façade. For instance, the presence of glass on both front and rear sides of the PV module allows a lower humidity and moisture penetration, reducing in such a way the PID mechanism. However, not only technical advantages can be identified for BIPV glass, since nowadays several new concepts and solutions are arising to allow the realization of active BIPV glass facades. In order to provide a clear – but not exhaustive – vision of some of these concepts and solutions, the innovation trends for BIPV glass are presented as the results of the “meeting points” between different disciplines/fields. Specifically, the authors have identified four main trends of innovation: optimization of aesthetics and efficiency (energy and architecture); transformation of ideas into real products (architecture and construction), development of technological BIPV solutions (construction products and glass facades) and development of active BIPV facades (glass facades and energy). The increased interest in nearly zero-energy buildings, as defined by the European Directive (REF), has led attention to the building envelope as a multifunctional and adaptive interface to be designed appropriately in order to the one hand reduce building energy consumptions (with more efficient solution) interacting with the outdoor conditions, such as winds, humidity and solar radiation and on the other hand produce local renewable energy. Moreover, the increased attention in solar buildings has created also an interest in the new role of BIPV facades, as active elements of the building skin. To allow architects new design opportunities for the aesthetical language of PV, researchers and module manufacturers are developing customized BIPV glass modules in terms of performance and visual appearance. In such a way, for example, PV cells can be camouflaged behind coloured patterns that completely dissimulate the original materiality of the PV cells. However, this involves a “shading” over the PV cells and a consequent reduction of the energy production, that needs to be carefully optimized in order to obtain an energy efficient customization of the BIPV modules. - Sandblasting: technique that consists in spraying sand at high velocities on the front glass surface, creating milky white patterns and sketch. Within the EU project ConstructPV , different BIPV glass modules have been designed and realized with this technique, paying attention to the balance between costs, energy output and visual effects (fig. 1). Other examples of BIPV glass modules realized with sandblasting are the ones designed by SolarGlasLabor , where additional colouring techniques are used (fig. 2). - Silk-screen printing: process that allows to print special ink on the glass surfaces in order to obtain a drawing. An interesting example of silk-screen printing has been developed by Ertex, that developed a process to obtain homogeneous BIPV glass modules in appearance . In the framework of the EU project SmartFlex , a novel digital ceramic-based printing has been developed, enabling to print high definition pictures (up to 720 dpi) on the glass (fig. 3). 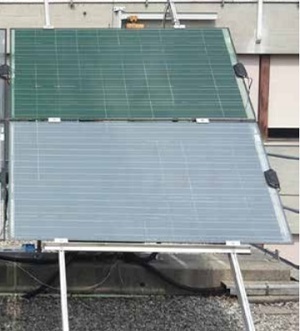 Also in this case, the optimization of the aesthetics and energy outputs has been investigated in order to provide efficient BIPV glass solutions. 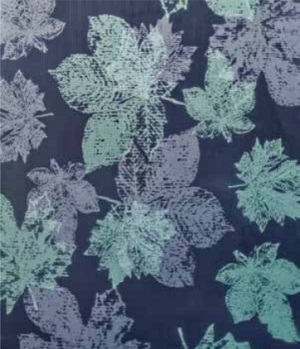 Another example of multi-colours ceramic digital printing on BIPV glass has been developed by the Lucerne University of Applied Sciences (fig. 4), where a specially developed method ensures that, despite the use of different colours, no partial shading and losses of more than 20% result . - Satin finish and glass printing: a satin finishing on the outer glass surface is combined with the silk-printing on the inner side. Therefore, there is a reduction of the glass transparency and a resulting coloured matte surface. Nevertheless, the treatment is carefully developed in order to allow light radiation to hit the PV cells, even though they are not visible. - scattering and reflection filters: this technique has been developed by CSEM . On the glass pane a front selective filter is applied. This is capable to reflect and diffuse the visible spectrum providing a white appearance, while the infrared part is transmitted and converted into electricity. In such a way, there is an efficiency reduction of about 40% in comparison to a traditional module. - spectrally selective coating: thanks to a special sputtering process, SwissINSO SA obtained coloured BIPV glass modules. For example, the conversion efficiency of these modules with white coating is 11.4%, instead of 19.1% of standard modules . The coloured coating is a thin-film deposited on the front surface by chemical etching and it allows to realize different colours such as grey, terracotta, blue, bluish-green, green and yellow. All of these techniques are carefully used in order to optimized the visual effect and the efficiency of the photovoltaic production, since there is a reduction of the incident light on the PV cells. It’s interesting to remark a double approach: on one hand a high-tech development has created new techniques and materials (mainly transferring them from high-tech research fields such as material science or physics and optics) and on the other hand a transfer of techniques already used in the building industry has been adopted to customize the front glass. It’s also relevant to consider that in some cases some aspects such as the design/production flexibility, the building performance and the cost-effectiveness still remain challenges to be achieved in order to ensure a feasible market penetration. What it is important to highlight is that some of the above-mentioned customizable BIPV glasses have been already implemented into real buildings. In some cases, these are lighthouse projects but also some private projects are arising, as a proof of a nascent market for customizable BIPV glass in a cost-effective and affordable way for the building market. In table 1, some Swiss buildings with innovative BIPV glass concepts are briefly explained, including the customization glass technique, the energy performance, the whole façade cost and the modules manufacturer. Today we can image a solar module that is completely recognizable within the urban environment, expressing its own materiality and language, rather than completely camouflaged with another appearance. In any case when such a novel and customized BIPV glass module is envisioned and designed, the next step is the characterization and testing to assess its performances, behaviour and reliability. In the case of BIPV, the modules should be compliant both with electrotechnical standards set in the IEC framework and the relevant building standards as established in the European Construction Product Regulation CPR 305/2011 and local building authorities. This means that the BIPV system should be capable to perform as a traditional building skin element, as well as to produce an adequate electrical output in its expected life. In order to foster this concept, two European standards have been developed and published in 2016, the EN 50583:2016 “Photovoltaics in buildings” part 1 and part 2 . With regard to BIPV glass module, there is also another international standard proposal– the ISO/DIS 18178:2014 “Glass in building. Laminated solar PV glass”  and, moreover, solar glass represents a topic in the Guidance for European Structural Design of Glass Components . This is mainly due to the fact that BIPV glass modules have some peculiarities (e.g. cells, electrical wirings, operating conditions…) that should be taken into account differently than a conventional glass panel. 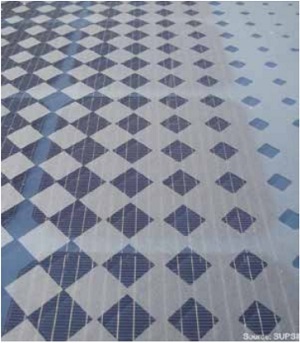 Specifically, in the case of customized BIPV glass modules characterized by the above-mentioned customization techniques, it is fundamental to guarantee the durability of the glass treatments. Indeed, BIPV glass modules are subjected to twofold stresses: internal thermal stress within the encapsulant due to the increase of temperatures due to the electricity production of PV cells (up to 60°C in operating conditions during summertime) and external stresses due to outdoor weather conditions such as rain, temperature variations, humidity and hail, therefore it is necessary to ensure the maintenance of the module appearance during their expected life or during the expected façade life (as an even better option) by means of dedicated aging tests. This means that a BIPV module, due to its peculiarities as a multifunctional element, should be characterized, tested and assessed according to a specific multidisciplinary approach integrating (not just adding) both building and energy/electrical aspects, in terms of performance, aesthetics, costs, etc. 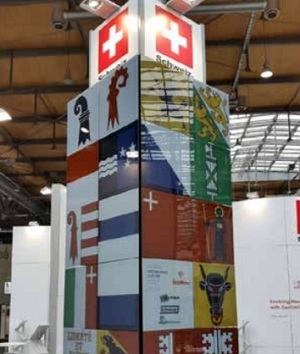 Table 1 Swiss buildings with innovative “aesthetics and energy” concepts. In the BIPV glass innovation field, one driving factor can be represented by the development of new solar glasses to integrate as functional elements of the building envelope, namely a construction product. Indeed, in accordance with the EN 50583-2, a BIPV system should also be capable to “form a construction product providing a function as defined in the European Construction Product Regulation CPR 305/2011”. Therefore, not only BIPV glass module should be designed but the whole building skin system (modules and substructures), that constitute the building envelope engineering. A multidisciplinary approach is the key-challenge. In this framework, the BIPV glass “domain” such as some manufacturers should refer to the knowledge and expertise of the glazed facade domain to properly develop and manufacture a component to be used as part of the building skin – e.g. some basic design principles concerning the mechanical safety such as avoid excess load in correspondence of continuous supports along the edges or avoid constrained supports such as rigid clamps. 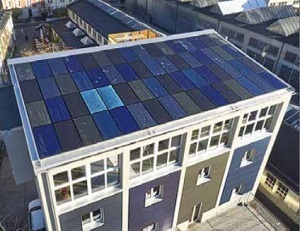 On the other hand, the BIPV glass “domain” can also give some inputs to the glass facade “domain” since there are some peculiarities that should be taken into account in the glass/façade design to ensure a reliable and optimal energy/electrical behaviour, such as the improved residual resistance due to the presence of PV cells interconnectors  or the stiffness effect of the junction box glued to the glass pane by means of sealant. Moreover, the use of BIPV glass elements – especially for glazed opaque facades – has led attention also to the development and testing of fastening systems with back-rails and adhesive elements to make invisible the mounting substructures and provide a homogeneous view of the glass façade (e.g. Structural Sealant Glazing), that have to guarantee the mechanical stability and resistance under the operating conditions. 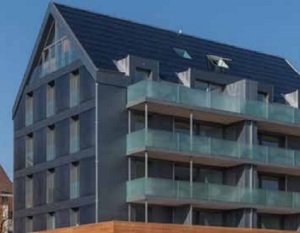 The importance of a strict correlation of the BIPV glass behaviour with the building skin technological solution is arisen also from the mechanical test activities developed within the SmartFlex project , where an “integrated approach” to evaluate the mechanical behaviour of laminated BIPV glass have been proposed . 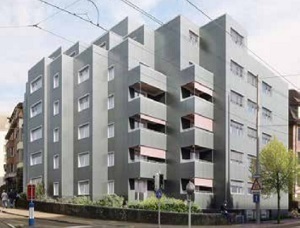 Moreover, another experience concerning mechanical tests have been performed by SUPSI also on a real BIPV façade system developed for the recladding of the Plus-Energy multi-family house in Chiasso (table 2). Indeed, in the first design option, even though the modules were mounted onto the metal substructure with a safety clamping system, the cladding PV module failed because of its high deflection from the substructure. Then, the second design option – consisting in the use safety clamps and the gluing of the cladding panel onto the rear metal profiles– succeeded  due to the greater rigidity and the proper connection with the BIPV glass element. Therefore, some of the previous examples, demonstrate that innovative solutions can arise often just from the investigation of the most reliable and optimal solutions to integrate a BIPV glass modules in a conventional technical system of the building envelope, also in a specific case study. Since glass has been used as a building envelope material in last two centuries, it provides a sense of de-materialization of the building envelope and lightness of the architecture. In 1960’s the idea of energy savings has firstly led to the development of the insulating glass unit to reduce thermal dispersions and, more recently, to the development of special adaptive and complex systems, such as high-performance filters to reflect a portion of the light spectrum or thermochromic elements capable to blocks parts of solar radiation. 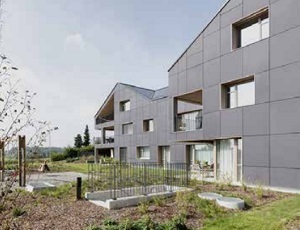 Also thanks to the Energy Performance of Buildings Directive, published in 2010, the building envelope has been identified as the smart interface between indoor and outdoor environment that can assume an additional function: the active energy generation thanks to integrated solar systems (photovoltaics and/or solar thermal). In this framework, some innovative façade concepts can be identified, such as the adaptive solar facades and the “bifacial” facades. An example of the former concept has been developed by the ETH team  in order to realize BIPV solar shadings moved by pneumatic actuators in order to control the visibility and transparency of the rear façade (table 2). The latter concept takes advantages from the recent development of bifacial photovoltaic glass modules, which can produce solar energy thanks to the direct sun radiation on the front side and the reflected radiation on the rear side. In such a way, a second bifacial PV screen can be integrated in the building envelope in order to exploit also the light reflected by the inner façade (e.g. in double skin facades). The CSEM building in Neuchâtel is a Swiss example reference that has been designed in 2015, for a total of 633 m2 and an expected annual energy production of about 50 - 60 MWh (table 2). Considering the relevant role of PV technology in the current energy policies at European and international level, a reflection about the innovation process affecting the building field is crucial. This study has been developed in order to present some main innovation trends in the use of architectural BIPV glass for building facades. A lot of approaches and developments in terms of manufacturing techniques and real case-studies have been discussed. the combination of building energy concepts and the façade engineering field. Of course, although we attempted to provide evidence on some driving principles and trends of innovation, undoubtedly a number of aspects remain still to be investigated and call for future research. What is interesting to note is that some innovation trends are already on the path to be implemented in Swiss buildings. This is also due to the fact that BIPV glass facade are already competitive today in terms of cost , when compared to conventional glass façades, so that a “BIPV façade” can today also represent an alternative to a conventional building envelope. Solar energy can represent an opportunity for the glass industry, not only for semi-transparent parts but also for opaque facades. In conclusion, in recent years, the efforts in the development of glass facades have led to spectacular building glass envelopes that are capable to represent resistance but, at the same time, weightless, even though this can seem an oxymoron. Today, building glass envelope has the chance to achieve a wider goal that is represented by its active contribution in the sustainability domain without losing the architectural elegance of glass.